Celebrating this glorious 60th Merdeka at The Top! We are offering an AMAZING OFFER of RM60 for all MyKad Holders (RM98 for Non-MyKad holder). The promotion will ends on 30th September 2017. Ticket purchased during this promo is valid until 31 December 2017. 🎉Full-access Paspot to all attractions in The LARGEST Indoor Theme Park in Penang, the first-ever curved Rainbow Skywalk in the world & Biggest Dinosaur Park in Malaysia. In addition, we will have a mystery surprise for MyKad holders who purchase the Merdeka 60 Promo Tickets! Eager to find out more? Stay tuned as we will announce it very soon! This Ticket is valid for the redemption of The Top’s Paspot (”Paspot”) to multiple entries on same day visit to all attractions in the Avenue of Adventures (”AOA”) and the Window of the Top (”WOTT”) at The [email protected] bearing the Merdeka60 Logo. Operation hours of The [email protected] are from 10.00am to 10.00pm daily. 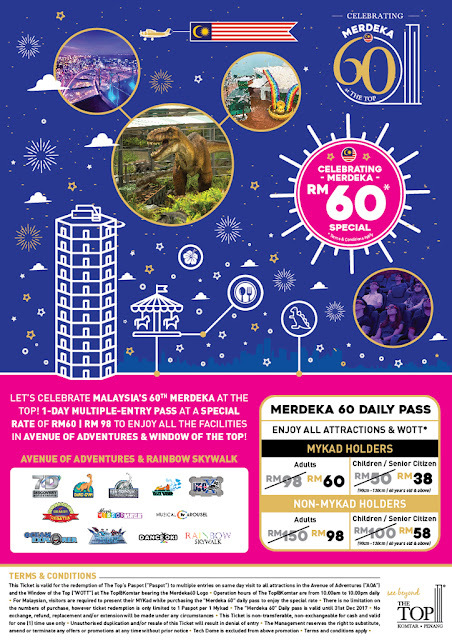 For Malaysian, visitors are required to present their MYKad while purchasing the “Merdeka 60” daily pass to enjoy the special rate. There is no limitation on the numbers of purchase, however ticket redemption is only limited to 1 Paspot per 1 Mykad. The “Merdeka 60” Daily pass is valid until 31st Dec 2017. No exchange, refund, replacement and/or extension will be made under any circumstances. This Ticket is non-transferable, non-exchangeable for cash and valid for one (1) time use only. Unauthorised duplication and/or resale of this Ticket will result in denial of entry. The Management reserves the right to substitute, amend or terminate any offers or promotions at any time without prior notice. Tech Dome is excluded from above promotion.